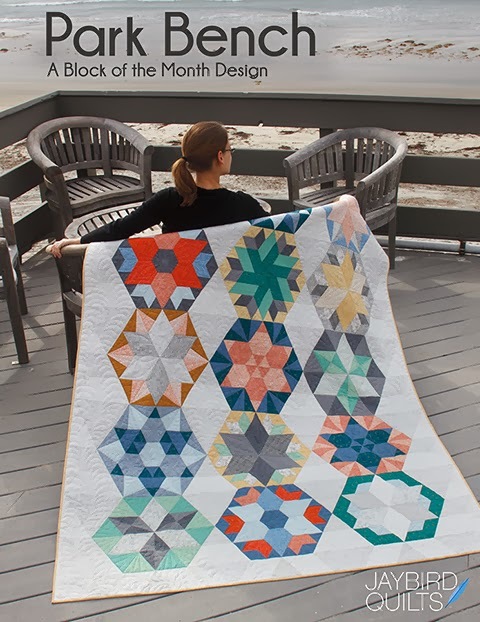 disclosure: this is a sponsored giveaway by Shelf Hi guys, I'm writing this post for a friend of mine, Lauren (from Lauren & Jessi Jung Designs). She's working on a really cool project right now that I wanted to show off for her. A few months back, she moved out to Cali with her business partner (and significant other), to launch a website that they've been working on together... called SHELF. I'm going to walk you through it using an example. Let's say that I'm doing Holiday shopping for my friends / family. First, I'll go to all of my "go-to" store websites to browse for gifts... at Express, I find some socks for my bro and a dress shirt for my BF... so I bookmark those two items on SHELF... Then I keep shopping. I find another dress shirt at Banana Republic for my BF as well as two sweaters that I think my mom would like. Next, I find some stuff at Gymboree and Children's place for my niece and nephew... and some funky looking pillows at Anthropologie for my sister-in-law. All of those gift ideas are now safely bookmarked on my SHELF. While I'm in "shopping-mode", there's no reason why I shouldn't look for myself too, right? So I got to DSW and find 3 pairs of boots that I like... Then I find a coat that I like from J. Crew and another one from Banana Republic. I also want a new set of dishes, so I bookmarked a couple different sets from Pottery Barn. And that should do it. All of my browsing is done. It's time for the magic. So, this is what your Shelves will look like. The items that you like are divided up onto Store Shelves and Category Shelves. This way you can see all of the items that you are thinking about buying, right in one place. Plus, you won't lose track of all your gift ideas. If you click on an item, a panel drops down that shows you details about that item. From here you can see how much the savings are... the total price... at the bottom is the shipping price as well as the promo code needed to claim any deal. On the right hand side is a price tracking chart so that you can see how much the price has fluctuated. And... best of all... you can set up price alerts. This jacket is WAY too expensive. I'm only going to buy it if it drops to half price. (Which is highly possible. Clothing companies try to clear out their inventory within 6 weeks.) So I'm going to set up an alert of $150. Then, Shelf will let me know when it drops to that price! How cool is that? This price alert feature is going to save me a mint during Christmas shopping. I started my shopping early this year, so I have time to set up alerts on all of these items. There's no sense in paying full price for anything anymore. If you set up alerts now, you'll probably wind up getting all of your gifts at much better prices! Look at this pair of Express jeans. The price was tracked from July to mid-August. Look how much the price has fluctuated! Isn't that crazy!! Getting a good deal is simply a waiting game! And Shelf will do all of the work for you. The last thing that I want to show you is the promo dashboard. 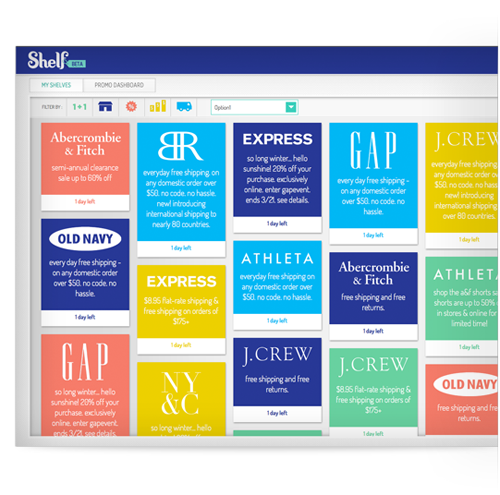 This is a color-coded view of ALL running promotions from your favorite stores. On the surface that doesn't sound like much... but think about the number of emails you get every single day from retailers. (The average online shopper gets 22 retail emails every day.) Now, you can unsubscribe from all of those and come to the promo dashboard on Shelf. You can also set up filters so that you are only seeing stores that you care about. This giveaway is for two $50 gift certificates. AND... you have a choice... if you're a fabric lover, it can be to Fat Quarter Shop. OR... if your friends/kids want to participate, they can get a gift certificate to whatever clothing store they like. (When the winners are notified, you can tell Lauren which store you want your gift certificate to.) So make sure to tell ALL your shopping buddies about this giveaway! 1. Go to Shelf and give it a try. Then come back here and post a comment on this blog entry with feedback. She wants to know if anything was broken... or confusing... what you liked or didn't like, etc. ...And it would also be nice if you could share this link with your friends and family. 2. If you don't like to do online shopping, then just pick out two friends/family members who are online shoppers and send them an email about Shelf. And tell them to try it out because it will really really save them lots of time and money. Then just let me know that you did option two in your comment. This giveaway is open until Friday October 5, and the winners will be announced here on Sunday October 7. Winners will be selected by True Random Number Generator. I love Shelf-it! I started using it a few weeks ago. I need to go start some Christmas shopping on it. That is a great idea! I'll tell some friends! Seems like a good plan. I love getting the best bargain. I do a lot of online shopping so this is really neat. I am most excited about being able to save my ideas all in one place instead of forgetting about them. It was easy to get started and the tutorial answered a lot of questions. Great concept! I love this idea. I do almost all of my shopping online and am always searching for coupon codes. Wow, what an amazing idea. I love the idea of the line graph and the coupon codes showing up. I always Google coupon codes, so this would save me some time! I think this will be very helpful for holiday present shopping. 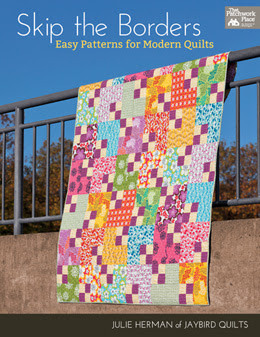 Do you suppose you can convince her to add a group of fabric shops as then I can see a lot of quilters loving it. Great idea! Here's a suggestion: I'd like to be able to add a comment for my own use - for example, if the item is a gift, who I'm thinking of giving it to. This is a great idea and I could make a lot of use of it. The only drawback I see is the limited number of sites currently supported, but I expect they will add more gradually. Please ddd Boden USA amd J.Jill. I set up an account with Shelf. This site is an excellent way to shop & i think its an ingenious idea. I used my tablet to begin shopping & encountered a couple problems with it freezing so im going to switch to my laptop to set up my shelves. 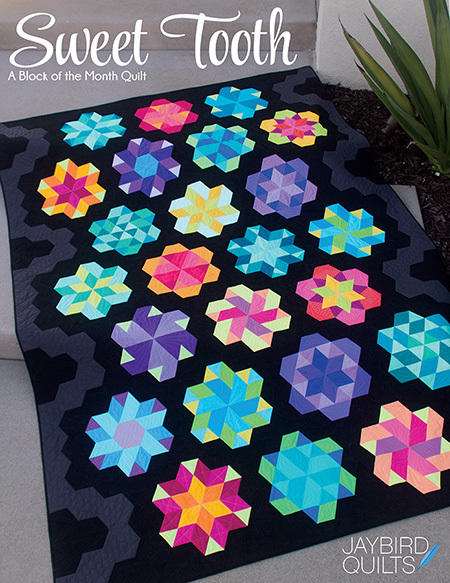 I agree with the other lady who said they need more quilting stores. I look forward to using this site & hope to see more store choices to shop from too as I'm a big online shopper! Way to go! What a neat idea! I joined and tried a few out from Old Navy and The Gap. I don't shop at the supported stores a lot so hopefully they'll get more stores soon. I mostly shop at Amazon. this is so cool!! i love the price tracking feature. It seems like a neat concept, but I don't like that I have to sign up to look around first, so I didn't get very far. I am thinking that this will lose some people before they get very far. I know I left quickly. I am having trouble adding things to my shelf. It may just be my computer right now. I am going to keep trying and watch the video again, too. Such a neat site! I just went through the steps to put the bookmark on my iPhone. I then tried to Shelf a product and nothing happened. Not sure what I did wrong, but it didn't work after I tried to copy and paste the bookmark code twice. Too bad. It seems like a cool idea. I don't do a lot of clothes shopping online so I did option #2 and sent a link to 2 friends. 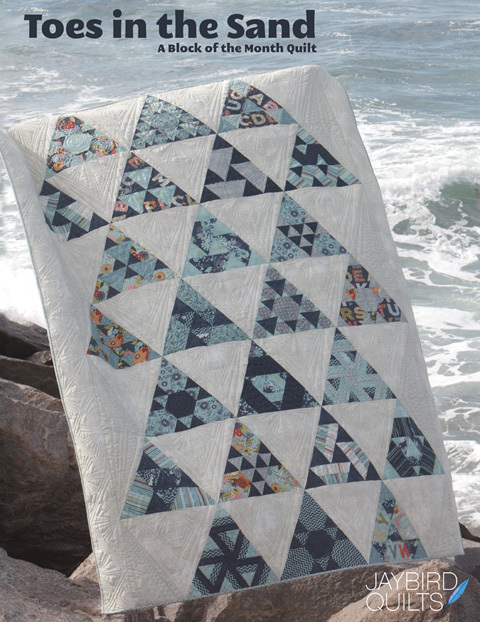 I sure would love something like this for quilting fabrics and notions though! That would be so helpful! I tried this once before and I was hoping it would work better for me this time, but I am still unable to put anythng on my Shelf. I logged in and chose a store from the list. Found an item and selected size. I clicked the Shelf-It button, but the message popped in from the left side that siad it looked like I wasn't signed in. The message said to go to My Shelves to log-in, so I clicked the button, but The Shelf site showed that I was logged in. I tried a different store and the same thing happened. This is an improvement over last time, because earlier, the error message just appeared with no background superimposed n the retail site. This time, the error message did pop in correctly from the left. It is a good idea and hope you get the kinks worked out. BTW - I am using IE 9. Shopped at Gap and Old Navy. HI! LOVED SHELF! 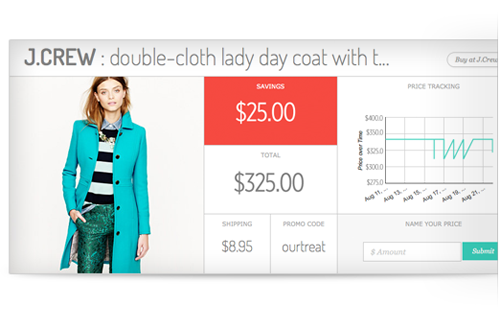 VERY COOL SITE+I LOVED PRICE TRACKING! THANKS FOR SHARING! I have a suggestion that is maybe already implemented, but I couldn't tell. All the promos in the promo dashboard looked like they had one day left. If there were different expiry dates I would want to be able to sort by expiry dates. Hi Betty, thank you so much for responding with details. People have commented on this before in the past and we weren't able to reproduce it. But we also are on Macs. I just checked the site on a PC and I had the same issue with IE9. We're going to fix this! This is a great idea... I am def. going to use it... I would love the ability to email a "Shelf" or wish list off of it... How cool would that be... I can bookmark ideas that I have for my kids holiday gifts and just send everyone a link to my list for each kid. I shop online all of the time. I have made 4 purchases today. I like this idea. I signed up as per the instructions. I tried to shop and clicked on Shelf-it and was told I wasn't signed in. The website did not take me to where I could sign in. I could see my name on the screen over on the right side so I am not quite sure what is wrong and why I can't use Shelf-it. I only shop for fabric online, does she do fabric stores? I did send this link to all my shopping friends though because I think it is a wonderful idea!! I don't like that I have to sign up first to look around. That's not how I shop! Thanks for the giveaway! Go To Your Shelves button to log in." Now I can't figure out what to do. I went back to the Shelf site, and I'm logged in. I logged out and logged back in, but that didn't help. Neither did refreshing everything. I like the idea, but it would have to be smoother than this for me to use it. By the way, I'm on a PC with Windows 7 and IE9. Okay, I tried it out. I like how it works...once I figured it out. Once I signed in, it told me to "go shopping!" ...which isn't actually the first step. I was halfway through Athleta before I figured out Shelf wasn't with me. Yes, I know I should read the tutorial first, but...just in case there's people like me, it should really say "put the bookmarker-thingy up there, and THEN start shopping." ;) Other than that, it looks pretty cool! Definitely interested in more stores. I put the icon in my toolbar, went through the tutorial, and then saw the sponsored stores. I'm too nerdy to shop at those stores, so I will have to wait until things like amazon or barnes and noble are added, but GREAT idea!! I love the concept but couldn't get Firefox to work (couldn't get the Shelf-it to appear on the bookmarks bar.I tried IE and it looked like it worked but when I select a garment, it said I wasn't signed in. I was signed in. I'll give it a try later. I like the idea of notifications when the cost goes down. My only suggestion to make it even better is to seek out and find the best deal on the web for a particular item if it is not site or company specific... ie: I want large rubbermade totes to store my Christmas decorations and it could tell me exactly which place has them cheapest! I love to shop on line - I loved looking around - although you have to sign up to really look around much. Would be great to have Barnes and Noble on there . I think this will only get better- as new shops are added. I am telling friends and my college daughter for sure! I sent a link to both of my daughters who love to shop online. Thanks or the giveaway. What a great idea Shelf It is. Well done Lauren. I had problems getting the Shelf It button in Chrome and IE as it just wouldn't add when I dragged it. However in Firefox it worked fine and I was able to add stuff from A&F site. I look forward to testing it out further. I have already set up an account with Shelf!! Even though I prefer to purchase clothing after trying items on, this tool will be amazing if I can wait for sales and price drops. As well, I am not an impulsive buyer, so this tool is perfect to make a Wish List. So far, the site is easy to get around and use! Hiya! I went to Shelf and signed up. I shopped at Old Navy, but wish it had more options for plus size women's wear. I like JustMySize and Woman Within. I think I'd still prefer the gift certificate to the Fat Quarter Shop, would rather have more fabric for my stash lol. Shelf is an intriguing idea, and will probably work for a lot of online shoppers. Best of luck to them, and thank you for having the giveaway. Blessed be, hugs!!! I think it is an awesome concept...but having a little trouble figuring out how to bookmark them and put them on my boards. I will definitely use it when I figure it out. This is a great way to shop! Two emails out (DSL users) as find that Shelf loads too slow on my dial-up connection. Oh well! Most functions online run slow on dialup. Thanks for a chance at the FQS giveaway. I am a big online shopper, but don't do much clothes shopping online because I always seem to find better deals in the brick and mortar stores. 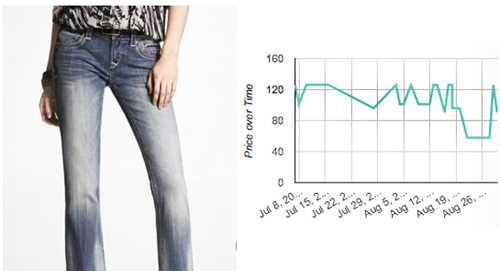 This site, with it's price tracking g is a great idea- sorta like playing the stock market with clothes :). The site is pretty slick, but on my little iPod it feels a little awkward to navigate. Do you have a mobile. Edison in the works? What a clever idea! I'm gonna like this a lot!! Pretty Nifty - except that I bought something on sale~ Need to tell my daughter about this. I shop online a lot. I the site for price tracking. Need to add some toy stores, and other stores like Target. Thanks for the great giveaway. 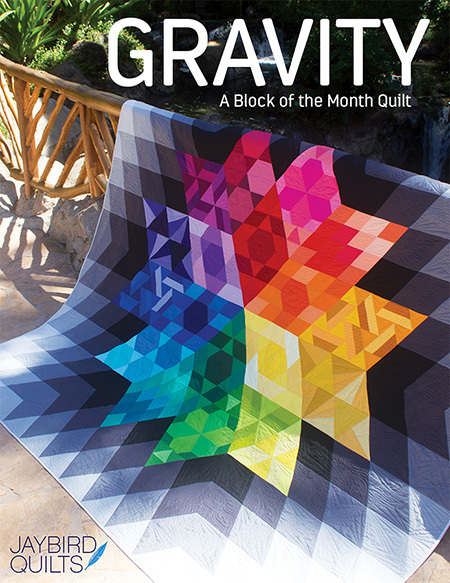 I would love to win the Fat Quarter Shop gift certificate. wouldn't work for me. All the engineers are busy right now. oh well. I understand that this is a beta site but the stores are very youngish! I was also wondering if they would be adding fabric stores. Great idea for those who love to shop in the Brand stores. Cool idea. I didn't get it to work exactly but I'll keep playing with it. This is a great concept! I would love to get rid of all those retailer emails I get every day. I wanted to suggest a couple more stores, but when I clicked on the feedback & support button, nothing happened. I tried several times. I'm using Chrome. Okay. So I registered and tried SHELF on the weekend when I had some spare moments and I managed to "shelve" a handbag and a top from Banana Republic and a top from the Gap. When I "shelved" the gap item, I had to add the price and that was okay. But when I shelved the Banana Republic items, it listed the price as $0.00 and didn't give me the option of changing it. I didn't have time to fiddle with it and dig a little deeper into instructions, so let's just say I "shelved" "shelf it" and thought I'd go back to it when I had more time. I didn't get around to shopping "Anthropologie" because I knew I would need more time and would have to have this thing figured out first. It wasn't coming easy to me, I must say. Is there a video tutorial? That's how I usually learn the ins and outs and tricky bits of new-to-me "google tools". Another question ... I'm in Canada and the link to the Gap store immediately suggested I shop Gap.ca instead. Also, I wonder about price conversions for Canadian "shelf it" fans. Being a non-USA-er, I've told some American friends about this great website! What a brilliant idea! I don't buy a lot of clothes online so I'll sent the site link to friends that do. But, if other options than clothes were available, I would totally use this site. Thanks for the giveaway. I am thrilled to think my shopping could be better organised, thank-you. The idea is tremendous and holds tons of potential, however I found the site was lacking in cohesiveness. I found it tricky to follow the instructions and I wasn't able to place the "Shelf" button on my taskbar as instructed. A lack clarity confused and irritated me (sorry! )I hope these kinks get ironed out as the polishing takes place because it would be a great benefit to careful shoppers. 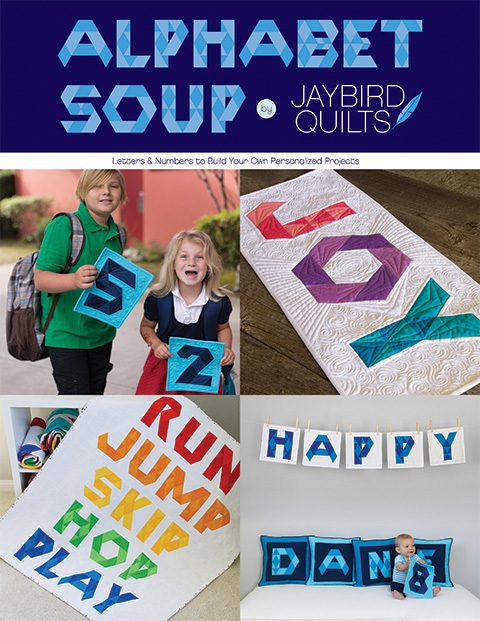 I would very much like something similar to help me sort out my fabrics shopping too, please! It looks interesting. I wish there were more stores and stores that sold things other than clothing, but this one looks useful for that. I sent the link to my DIL; the selection of stores is right up her alley. What a cool website! And the intro tutorial was quick and helpful...very user friendly! Thanks for sharing, Julie! I took a look at the promo video that was posted and it looks amazing! I'll be back when I have time this weekend. I'm going to start some Christmas shopping. Do you know if we put in a fabric item from an online shop would it track price and availability for them just like a dress? I've shared with two friends and plan to check it out myself. Thanks for sharing the new site. Good luck to Lauren on the new venture. How cool is that, I checked it out and I will need to spend more time with it, but I can't wait to share the idea, thanks for letting me know about it. The tutorial was really great. I would love to see full support for Boden USA. I love the idea of Shelf, especially the Price Tracker! I can see it really saving me a lot of time. As far as functionality goes, I had a few problems signing up using my Facebook details. I was directed to a page not found screen, and when I tried again the connection timed out on the "Now loading your profile" popup. After a few tries at refreshing, I was able to get to my shelf. I would love more variety with supported stores, especially craft/fabric stores. Overall, though, I really enjoyed my experience and can see myself using this often, especially with the Christmas shopping season beginning.